Of the many theories I used in university, there are only a handful that I’ve been able to practically apply in my professional life. Robert Cialdini’s work on influence and persuasion is definitely one. Twenty years on, I still think about his principles of persuasion and routinely apply them in sales and marketing practices. They have been key in influencing our sales training and practice at Prime Creative Media, and offer some important insights for any company looking to grow its share of the market. These levers of influence are not only helpful in training a sales team, but can prove instrumental in ensuring the effectiveness of marketing campaigns. We offer these five levers to consider in developing your sales and marketing strategy. People who are going to buy something generally feel better when they buy from people they like. The big question is: how can you create likeability? The answer can be as simple as dressing well, smelling nice, acknowledging people’s interests, or using good manners. From a marketing perspective, likeability can be translated through written content. Quality content not only provides information, but can also portray humour, goodwill and empathy, which help a brand foster and enrich relationships with customers. Display ads also help increase likeability when using warm colours, positive messages and friendly faces. Too often, B2B businesses forget that they are still marketing to people, so their campaigns should utilise these practices to help potential buyers like them more. There is incredible power in showing generosity during the sales process. People who have received a gift (without strings attached) feel a sense of obligation to reciprocate. At Prime Creative Media, generosity is one of our core values. We aim to demonstrate our commitment to commercial relationships, our willingness to go above and beyond, as well as giving more and working harder to deliver real value. In a marketing and sales plan, reciprocity can be encouraged through the sponsorship of events, or the distribution of free, helpful content to potential buyers. By showing that your company invests in the industry, you will have a major advantage over the competition and clients will feel better about giving you their business. Sales coaches and trainers regularly talk about building networks, generating referrals and listing the clients you work with. This is because they understand the power of association. Basically, trust is often earned by association. ‘You know Jim, so you must be ok.’ This applies in the B2B environment through word-of-mouth. When customers speak about you and are positive about how much they like you, social proof kicks in to overdrive. Trust can be built into marketing campaigns through the use of case studies. Companies love to read about their peers as well as their competitors. When they read about a positive experience that company had with you, and how you helped them fix a problem, that’s social proof, and it will help lead them to you for a sale. It’s human nature to want what we don’t have and can’t acquire. An even more powerful motivator is the fear that we might miss out due to limited availability. A study published last year in Psychological Bulletin looked at 50 years of research into the use of fear in sales. “These appeals are effective at changing attitudes, intentions and behaviours. There are few circumstances under which they are not effective,” the authors wrote. In a world of information overload, people can’t make all the decision that they’d like to or need to make. Building genuine scarcity into your sales and marketing communication can help your prospective customers prioritise the decision to do business with you. 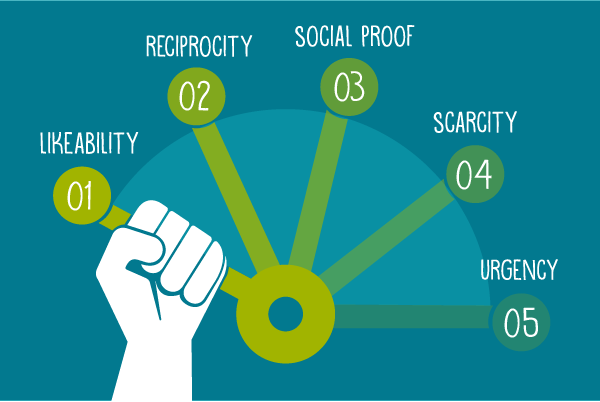 Similar to scarcity, urgency has become an essential element in decision-making. In B2B markets, more corporations have adopted strategies like just-in-time management processes across their entire business. Decision makers are often overwhelmed with the volume of work they need to get done on any given day. Why do they need to make the decision to purchase your product of service now? Make it urgent. Use this message in your marketing campaigns to communicate the urgency and engage your customer. When designing a marketing strategy, don’t forget that these decision makers are people. By applying these psychological principals, you and your team will have a clear advantage in making a sale.